The late supreme king, who died in 1868 at the age of sixty-five, was tall and slender in person, of intellectual countenance and noble, commanding presence. His ordinary dress was of heavy, dark silk, richly embroidered, with the occasional addition of a military coat. He wore also the decorations of several orders, and a crown—not the large one, which is worn but once in a lifetime, and that on the coronation-day—but the one for regular use, which is of fine gold, conical in shape and the rim completely surrounded by a circlet of magnificent diamonds. 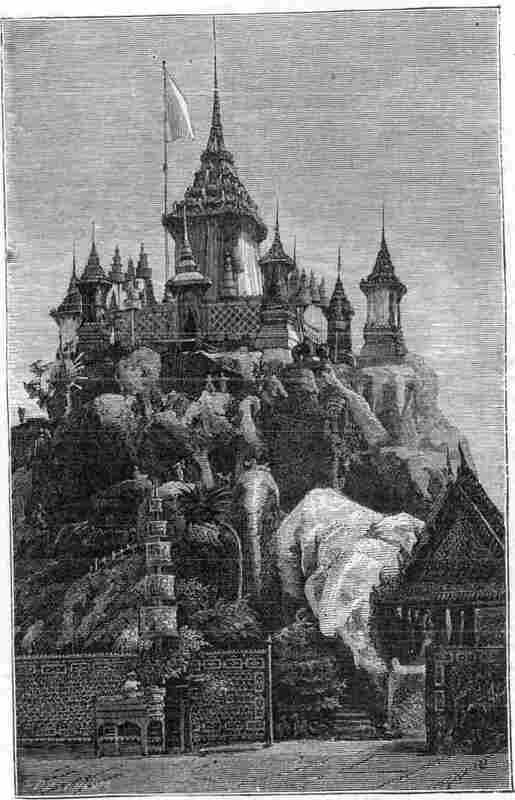 This prince, the most illustrious [pg 647] of all the kings of Siam, spent many of the best years of his life in the priesthood as high priest of the kingdom. He was a profound scholar, not only in Oriental lore, but in many European tongues and in the sciences. In public he was rather reticent, but in the retirement of the social circle and among his European friends the real symmetry of his noble character was fully displayed, winning not only the reverence but the warm affection of all who knew him. He died universally regretted, and the young prince now reigning as supreme king is his eldest surviving son: the second king is his nephew. Funeral Pile for the Second King.